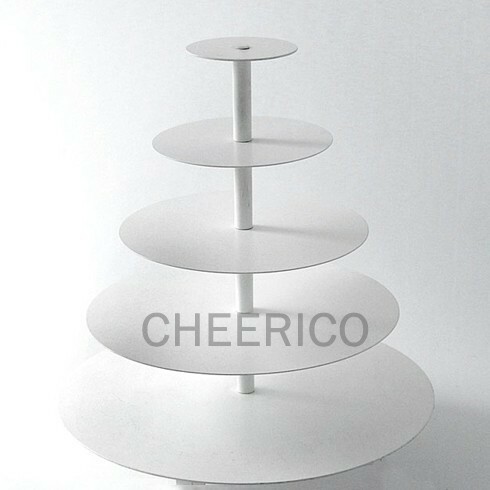 This stand can be used as 5, 4,3,2 tier stand Ideal for Wedding parties and celebrations for cupcakes and buffet food. The edges of the acrylic are perfectly clear and polished. Every part of the stand has been accurately cut and finished. # Each tier is 100mm apart and the total height of the stand is 430mm. # 1st,2nd,3rd,4th, 5th tier is 5mm thick . This cupcake stand can hold approximately 60 cupcakes.We base our numbers on using a 60mm diameter cupcake. The four small round plastic feet are included. Below you will find an example of how many cupcakes can be arranged on each tier. The stand is not designed to move around once built so construct it in its final restingplace. Do not attempt to move the stand once it has cakes on it. * The stand is not designed to move around once built so construct it in its final restingplace. Do not attempt to move the stand once it has cakes on it.